Yesterday, in what was not nearly funny enough that it could be an April Fool’s joke, the US Food and Drug Administration issued a statement that they “may” allow changes to pharmaceutical nicotine product (NRT) labels to reflect a bit of reality. In particular, the label would not be so restrictive about the period the products can be used and there would not be warnings about simultaneously using multiple tobacco/nicotine products. Those warnings had many smokers and others convinced, for decades, that violating those protocols put them at dire risk. Many were convinced that they might as well smoke rather than dare defy the label. This comes following hearings a few months ago where several of us from CASAA found ourselves in the odd position of testifying on the same side as the pharmaceutical companies. We were arguing in favor of explicitly allowing long-term use of low-risk nicotine products like their UK equivalent, the Medicines and Healthcare products Regulatory Agency (MHRA), already does, with the recognition that this would also tend to open the door for recognition of other THR options. First, the bad news: The unit of FDA that oversees NRT and made this move is the Center for Drug Evaluation and Research. They are not the unit with the authority to regulate all other tobacco products, the Center for Tobacco Products, and so nothing about this extends beyond NRT except in spirit. Additionally, the very weak move does not go nearly as far as the MHRA. The language will still insist that the products should be used only in pursuit of nicotine abstinence. Second, the lies: I will not bother with the boilerplate lies about tobacco use that always show up in writings like this, focusing only on the substance of the statement itself. FDA states that these particular products do not have “significant potential for abuse or dependence”. 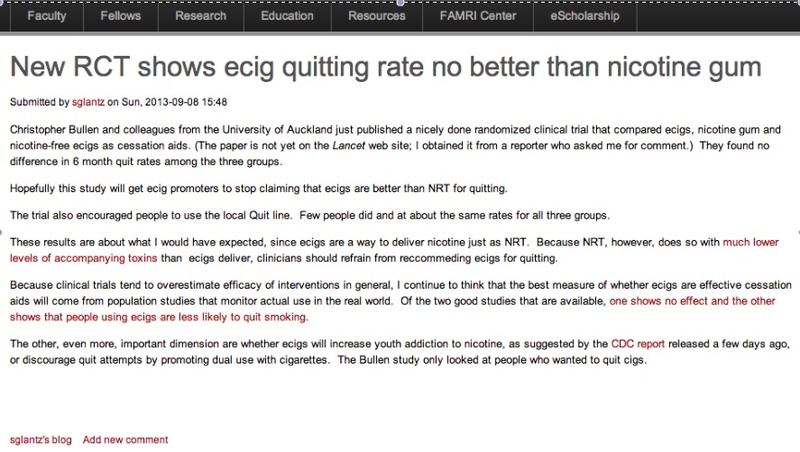 Not only does this indicate their commitment to the bad old model of NRT (“if you use this to become abstinent, you have our blessing and sacred permission, but if you use it, say, just because the effects of nicotine improve your life, then you are abusing it, you evil degenerate”) but it also presents a backhanded indictment of other products by suggesting a contrast. Since long-term NRT use seems to resemble use of any other tobacco product, particularly e-cigarettes, this implicit distinction is a lie. The statement also nerfs the recognition that long-term use of these products poses no major health problem by stating, “Consumers are advised to consult their health care professional if they feel the need to use an [over the counter] NRT for longer than the time period recommended in the label.” But if health care professionals generally had half a clue about this, the move by FDA would be moot. Those that know the truth have been offering accurate advice about THR (using NRT and other low-risk alternatives) all along. The others are not going to suddenly acquire any understanding that they currently lack. Third, the good news. This opens the door a crack toward the US government to recognizing THR. It is an embarrassingly small crack, given the accumulated evidence and the move by the British, and is not nearly enough to end the US government’s reign as the worst anti-THR liar in the world, but it is something. More interestingly, there is an official recognition that the favorite ANTZ bogeyman, “dual use”, poses no harm in itself. The FDA admits the obvious, that there is “no significant concern” about using multiple products at once. Of course, the ANTZ will cling to the specific wording: Since this is a statement about just NRTs, the statement about using multiple products at the same time is phrased in terms of one of them being a pharmaceutical industry product. Thus, the ANTZ will claim, if someone is using more than one product, and none are made by the pharma industry, then that is somehow still bad. The FDA has stated that there is nothing harmful about dual use. Of course, everyone who is not a liar or one of their useful idiots already knew that. It is obvious, and there has never been any reason whatsoever to believe there was any harm generated by mixing products from two categories, any more than there was about mixing cigarettes from different packs. Still, it is fun to say that this knowledge is now “FDA approved”.